Sharing files is no more just restricted to emails or zip files and is rather an age-old concept now. Till date whenever we think of sending files to clients or co-workers online, the first method that you recall is to send them via email! The fact that email comes with limited file sending capabilities related to the size of the file or to the number of files that you can send at one time makes the user feel helpless. However, with the file uploading services like Google Drive, Dropbox being the flag bearers in the category and other small-scale sites that take added risks, the entire file sharing concept has been revolutionized. But, if you are otherwise thinking of offering the huge data through a pen drive instead by traveling all the way down to your client, is definitely not a great idea. While most of the online file uploading services needs you to sign up and create an account, there are some of the websites that help you to share large sized files easily and anonymously. Therefore, today we have composed a list of the best anonymous online file uploader services that are amazingly easy to use and completely free of cost. So let’s take a quick look. Firefox send is a file sending service from Mozilla firefox. 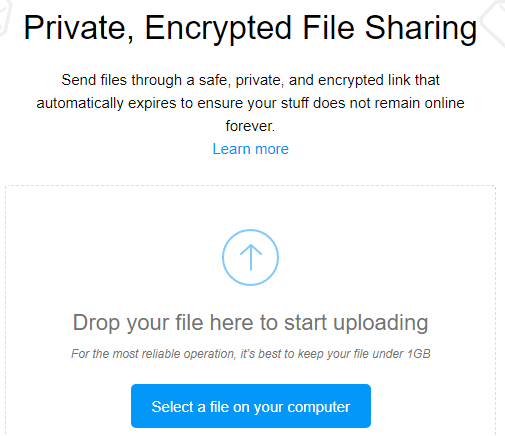 It lets you send files up to 1 GB to any friend via an encrypted link. There are only two limitation to the service. The link expires in 24 hours and the file gets destroyed from mozilla server once your friend has downloaded it. But, the service is secure, fast and encrypted and if you plan to send a large file to your friend securely, this is the way to go. A simple interface and easy to use Openload.co is one of the most visited file sharing website on earth. Its an advertisement based service and thus completely free to use. Just remember to turn on pop up blocker on your browser. If you are looking for a file hosting domain that enables you to share files in the wink of an eye without signing up File Dropper should be one of your primary choices. You just need to upload your file, click on the share link and zoom, you are there! You can now copy the File Dropper link or the embed code and share your files with whoever you want for no cost at all. This website offers one of the simplest solutions to its users as an alternative to other premium file uploader services viz. Google Drive, RapidShare or Dropbox. Though you do have an option to sign up here for free, the fact that it allows you to share files for free is what we love. The files that you upload are saved forever considering they are downloaded. They get deleted if not downloaded even once in 30 days for anonymous uploads, however, for premium accounts the uploaded files remain forever. What more, as for anonymous sharing the allowed upload size is as large as 5GB and there are no countdown tickers to disturb your sharing process. Okay, so if you are keen to share a collection of images rather than one at a time, then Ge.tt is just the right tool for you. It is a free web tool where you can share files even without signing up for an account. To make sharing simple you can drag and drop an entire photo collection at once, using the tool. The shortlink that is generated can be shared either using email or to your social networking accounts such as, Twitter, Google Plus and Facebook. Your social media friends will then be able to view your photo album and even download them. What you need to know here is that your shared files will be available to you only for a month (30 days). In order to keep them shared files forever you need to sign up with Ge.tt for an account. If you share files anonymously you get free storage of upto 250 MB, while with a registered account you can have more fun with storage of upto 2GB. If you feel that’s not enough for your photos with a relatively higher resolution, you can certainly opt to register for higher storage that is upto 5GB, 40GB or even 100GB, however, at a reasonable price. If you are looking to share files anonymously for free with a web tool that caters you a process that’s easy as a cake walk, We Transfer is surely one of those tools. Not only that it’s available to use at no charge, but also offers you an extremely user-friendly and easy to understand file sharing process without any sign up required. 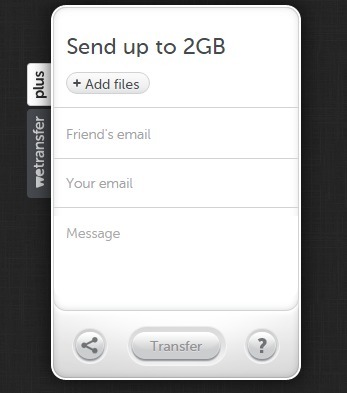 We Transfer allows you to share files anonymously and with a secured process for an upload size of upto 2GB. While it is an extremely simple to share files, it also gives you complete control over the upload process. This web tool lets you share files with anyone and to any part of the world at any given pint of time without any hassle. Sending big files is no more a problem since you have Sendspace as a solution online. This web tool helps you to share your large files effortlessly via email to your contacts. While you can send files easily, you can also receive, keep a record and even share big sized files. Even though the site uploads and sends file more perhaps more than a million time per week, still they consider each of your file equally importance and treat them with same preciseness as with the million others. Sharing files with Sendspace is free for upto 300MB file size where you can share big file anonymously that is, if you do not wish to sign up. The files you share are stored in the site for a maximum of 30 days beyond which it gets automatically removed, unless you go for their pro versions which offer a lifetime storage, upload size of upto 4GB or 10GB, file sending size of upto 100GB to 300GB and speedy downloads with no annoying ads. While buying a pro version can certainly give you a faster experience with more upload size and storage, the free version is sure to give you an instant solution with anonymity. One of the other best free file uploader services in the category is Zippyshare that allows you to share your files online as well as store them and all for free! It offers an extremely simple process of sharing by either drag-and-drop or browsing and uploading the files. The fact that it is 100% free with no download restrictions upto 200MB per file, can be downloaded anywhere and is super user-friendly makes it one of the most popular files sharing tools in its leagues. What we love about Zippyshare is that it offers unlimited disk space and you can easily share files with your contacts without even signing up. It also gives you the option to upload your files in private mode in case you do not want it to be visible to all. The free version comes with the old HTML uploader as the uploader tool, however for the new tool you can sign up. Moreover, all the files that you share anonymously will be stored in the tool for a maximum of 30 days beyond which they get automatically deleted in the absence of any activity. For that quick and easy file sharing solution anonymously which is free for life you can surely turn to this extremely simple web tool Tinyupload. There is nothing much to ponder about as the landing page itself offers the upload tool where you can browse and add your files. One of the additional but optional feature that it offers here that you can add a description for your uploaded the file before your send it to your contacts. While we tested it, we can safely say that the upload speed is quite good in its league. Tinyupload then generates two shortcodes for your file, one of which is for download the other for deleting the file if you wish to (a feature that is not available in some of the other free file sharing tools). So while it’s that easy to upload files and share them in minutes, it is imperative to note that the file size is restricted to 50MB per file. So, even though it says that there is no download or upload limits, with that 50MB file size restriction it is clear that it rather does. Moreover, Tinyupload hosts the downloaded files forever at no charge. It could not be easier than this when a home page shows a page just asking you to drop files and no other humdrum. We are already in love with this uber-simple tool where you just need to drop the file and that’s it. As you see the page continues to refresh each time you drop a file you gain more confidence in this newly created web tool for file sharing. As soon as you add the file, it instantly generates a shortcode for you to share it with your fellow workers or clients. While you surely can sign up for an account, you can also use this tool absolutely free of cost anonymously for file sizes upto a max of 1GB which is a decent offering compared to the other tools in the league. In the meantime, your online buddies who have access to your added files can even download them. While you choose a file to download, Dropcanvas automatically shortens the selected files to lessen the load of the file. On the other hand, the editing option that you see in the tool it means that you can add or remove files from it and is not an option to edit images. However it’s great to know that, even without signing up or registering for an account you can upload unlimited files and even store them despite the fact that the file size is restricted to 5GB per canvas. Canvas is the tag assigned to an album or a bulk folder, so if you want to keep a track of each canvas you can create free account by signing up. Therefore, if you are especially looking to share music files or video file of large size, Dropcanvas can easily be your best bet. I prefer MyAirBridge (www.myairbridge.com). Totally for free you can send up to 20 GB, with profile even up to 100 GB. i am very impressed for your nice list.Thanks a lot for sharing with us. 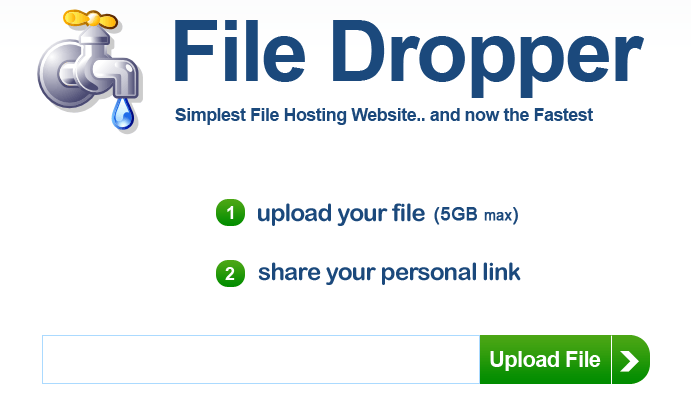 http://www.filedropper.com/ requires one to sign up to upload and share files. Don’t see how that can be anonymous, unless one wants to go through the process of creating a fake -email address. You forgot about MEGA. Best encryption and file life dont depends on downloads/activity. Well, If you want to use Anonfiles.com or Uploadfiles.io? Then you have to use VPN + Tor Browser before upload files on Tor is very full-totally anonymous than use Firefox, Chrome, IE, and other browsers.